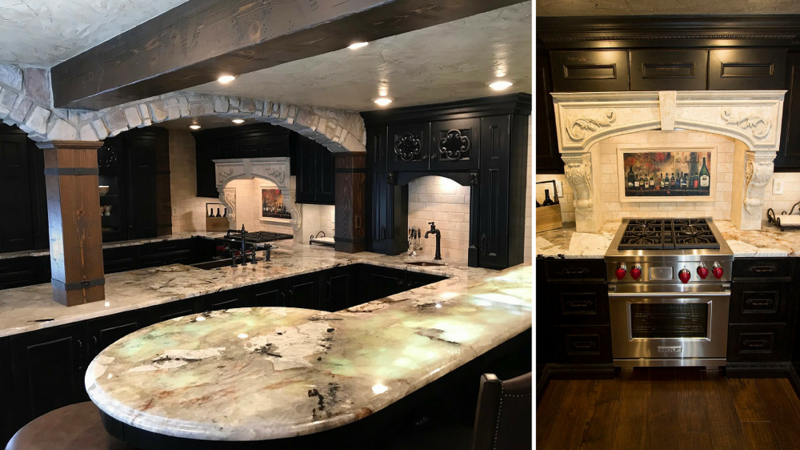 The complete lower level of this Brecksville, OH home has been transformed into a Tuscan inspired retreat complete with a full kitchen, bar and entertaining space including a wine room and a full bathroom. The stacked stone and stucco textured walls with cedar beams running throughout gives the space an old world charm. 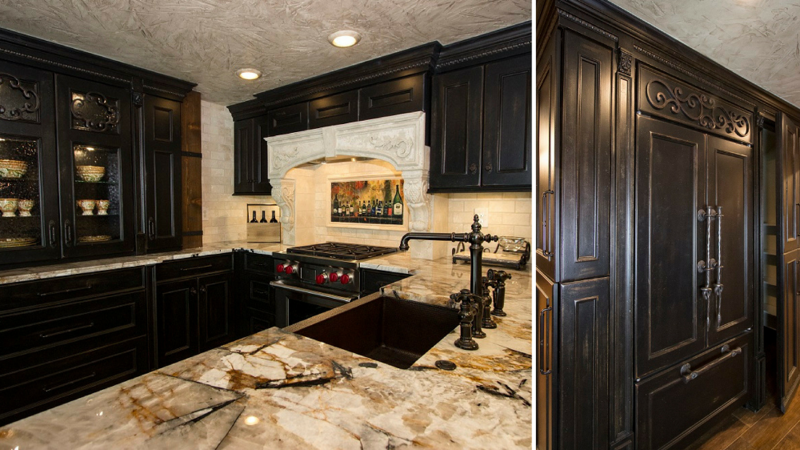 Custom maple cabinetry in black with a bronze finish is topped with Bianco Clarity Granite. Beautiful custom metal accents and rustic hardware enhance the kitchens old world Tuscan inspired look. The kitchen is equipped with professional appliances including a Wolf range and an integrated Sub-Zero french door refrigerator/freezer that blends seamlessly with the cabinetry. The Kohler Artifacts faucet pairs beautifully with the hammered copper farmhouse sink. 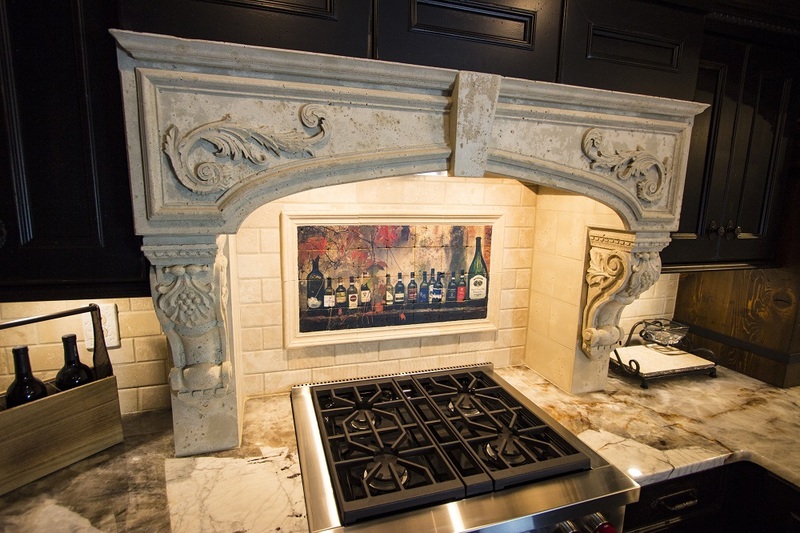 The custom cast stone range hood was hand poured by our artisans. The beautiful wine mural backsplash was printed on travertine tiles. 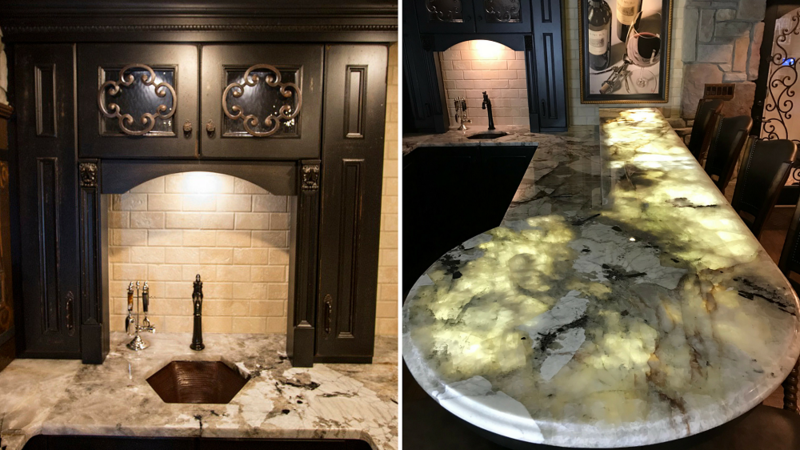 The Bianco Clarity Granite bar top is illuminated from underneath with the light shining through the translucent pieces of quartz within the stone. The hammered copper hexagon bar sink is paired with Kohler Artifacts bar faucet. 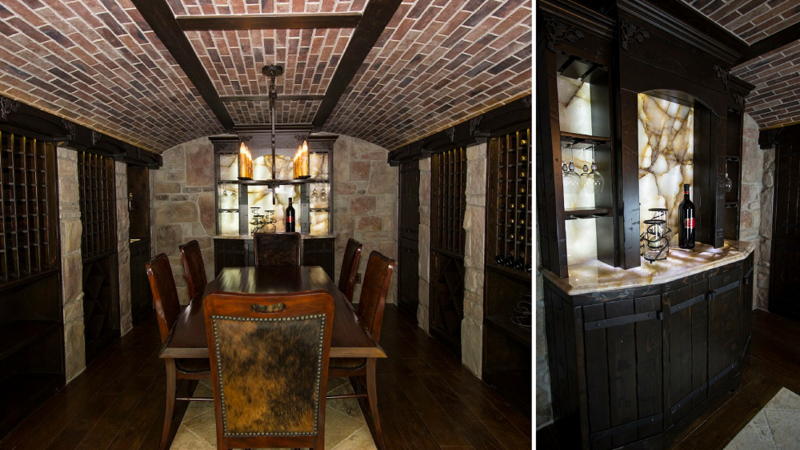 The wine room is a great gathering space filled with plenty of custom wine racking and storage. The barrel ceiling with red brick tile gives the space the authentic wine cellar feel. The wine bar is custom made with old world cedar planks and iron straps. The bar is illuminated with Lumix quartz. 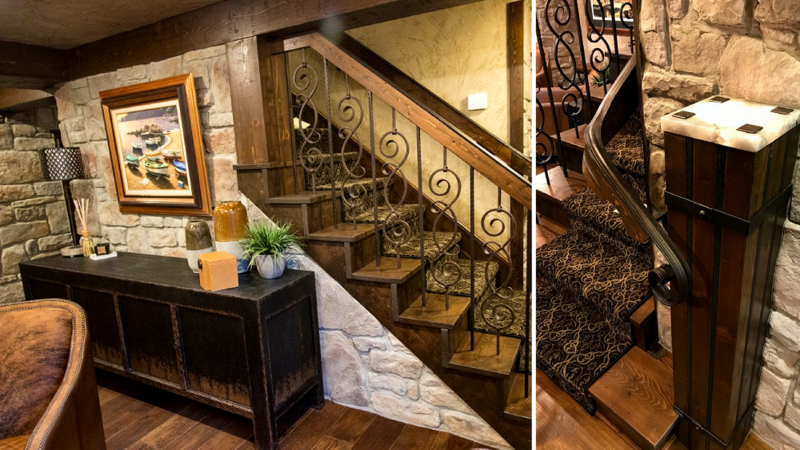 The staircase leading down to the lower level includes custom iron balusters and cedar newel posts with the metal strap accents topped with quartz. 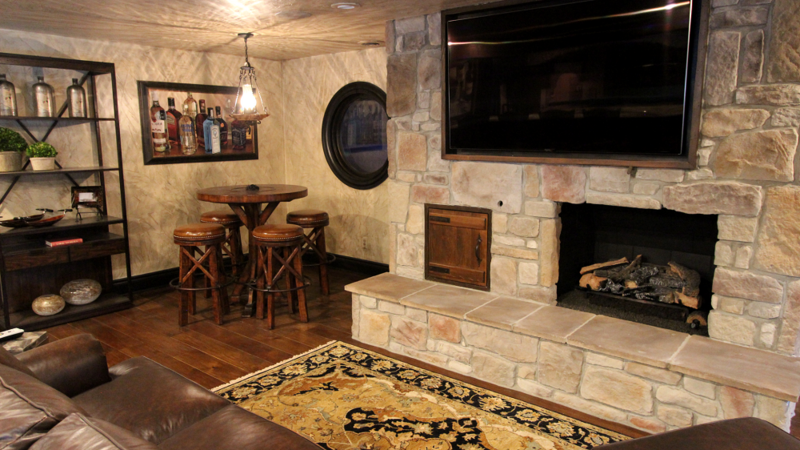 This lounge area is great for entertaining with a custom corner scotch cabinet and cigar humidor. 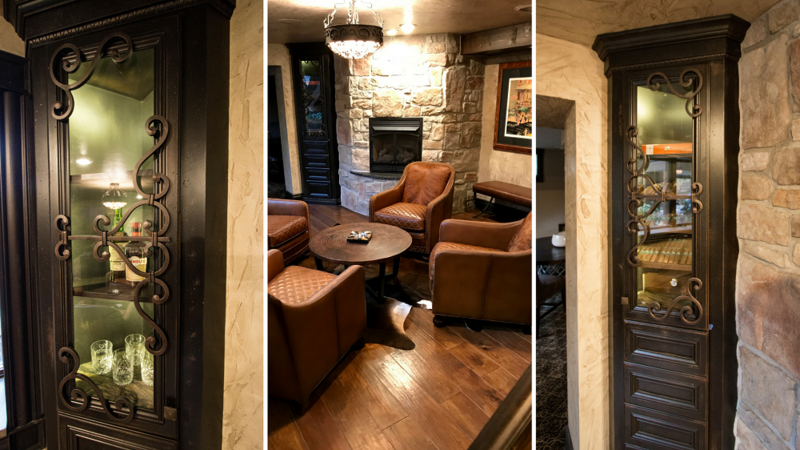 This entertaining space off the kitchen/bar is a great spot for guests to gather around the stone fireplace and watch the game. The bathroom vanity matches the custom cabinetry throughout the rest of the space and is topped with a classic light travertine. The marble sink basin pairs beautifully with the Brizo faucet. 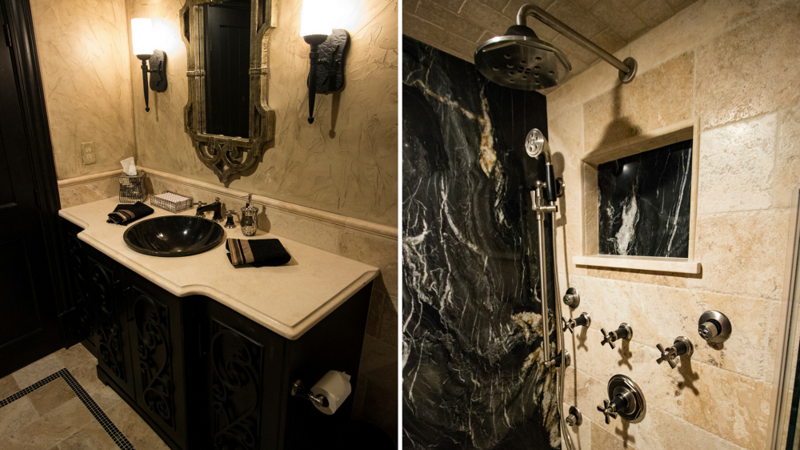 The steam shower is fitted with Eclipse marble and paired with travertine tile. Call us at 330.225.6000 to speak with a designer or click here to schedule a consultation.